I’m not for a moment suggesting that any of the games I will mention are directly inspired by historic events. As with my comparison of Gunblades in and out of videogames, my intention is to highlight the parallels between fiction and reality. In the case of animal weaponry, real life is sometimes sillier. 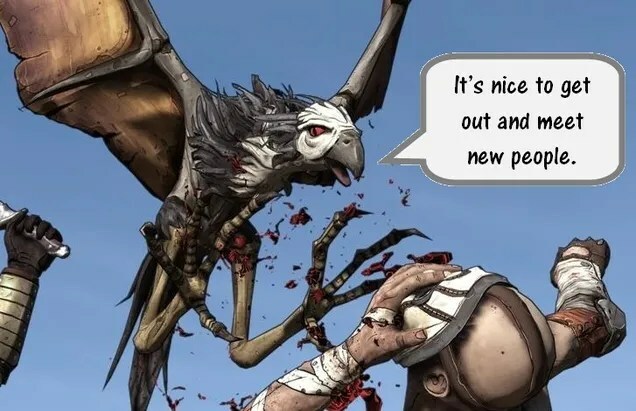 Consider all the games that use birds as weapons. Bioshock Infinite has its malnourished crows,Borderlands has a bald eagle with a grudge against eyeballs, Dr Robotnik’s arsenal includes a range of avian mechs and Angry Birds has…birds. 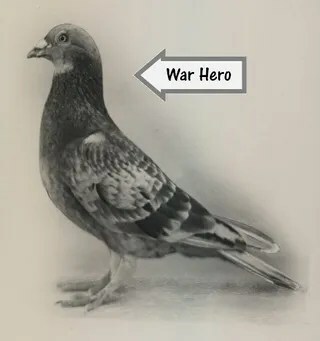 The point is, videogame birds might be deadly, but only in History did someone decide to put pigeons in missiles. I’m glad to say that Project Pigeon – because why would you call it anything else – never made it past the research phase. However, the practice of using birds as a guidance system did receive genuine interest (as well as $25,000 from the NDRC, which is nearly $350,000 by today’s standards). The principle: sets of three pigeons would act as the guidance system for a missile aimed at ships at sea. The three birds would be trained to tap at an image of ship on a screen (to receive a treat) When their missile was put into action the birds would tap towards thereal naval vessel, steering the missile to its destination. The idea isn’t so ridiculous; the guidance system required to guide a missile in 1937 would be heavy, cumbersome and expensive. Besides, no one would miss a bunch of ‘flying rats’. Let’s go back to Borderlands. The bald eagle known as Bloodwing has a difficult time of things. The only time he sees the light of day is when his owner chucks him at someone’s face, and then he has to go away again. To make matters worse, Mordecai can decide to set the bird on firebefore letting him take flight. It looks awesome, but is no doubt terrifying for the eagle. Surely no one in History has ever been so callous? You know, apart from when the Romans used burning pigs to fight elephants. The use of such a tactic is ambiguous, but it’s clear from the writings of Pliny the Elder that there was an accepted use of “War Pigs” during the Roman era. War Elephants were apparently troubled by the squeal of pigs, and this fear could be escalated by covering the pigs in tar and lighting them. That makes sense; I can imagine that I would be slightly unnerved by the sight of flaming balls of pork screaming towards me; the smell of bacon would do little to calm my nerves. So, whilst the sight of the burning Bloodwing might strike some as ridiculous, History wins another point for absurdity. The Worms series is chock full of various weaponised animals. Some bound forth from the earth-eating warriors, some burrow through the ground, and one or two fall from the heavens. Yet the end is usually the same: a big, fiery explosion. In this fictional landscape, the sight of exploding animals is comical. In History, exploding animals were used on more than one occasion… which says a great deal about us as a species. You may have already seen this image floating around on the internet. This is a photograph highlighting the attempts made to turn dogs into bombs. Most tank crews would think nothing of a stray mutt wandering up to their machine; by the time they noticed the explosive vest it would be too late. Just like the sheep and ferrets of theWorms series, the detonator is in the hands of the owner. The “dog mines” were an idea invented by the Soviets, and were employed against the Nazis in 1942. This plan backfired in a big way. Whether you believe in karma or not, the creators of this fiendish idea got their comeuppance. This tactic relied on the dogs doing as they were trained to do – seek out the nearest enemy tanks and crawl underneath – but the dogs had been trained using the tanks that were available. On more than one occasion the Russians would watch in horror as the dogs scampered back towards the Soviet battle lines still carrying their explosive payload. The whole debacle made as much sense as exploding sheep with super powers. These examples only scratch the surface of animal weapons in History. For every bizarre creature-based weapon used in videogames, History as an equally bizarre counterpart. Not to mention all the times in History when animals have been used for espionage. Corvo fromDishonored has his ability to inhabit the mind of rats and sneak around, and the CIA spliced recording equipment into cats in a failed attempt to spy on the Kremlin. You decide which version is stranger. As with my last ‘Videogames vs History’ blog, I’ve tried to give just a few fun facts with the hope that you might seek out the rest. If you don’t feel the need to find out more about all the ways us humans have turned animals into tools of war, you might instead want to find out about all the animals that received medals for bravery since the Second World War. Or maybe you’d rather take the easy option and ask me for more information. Feel free to leave a question below. Maybe you’ve spotted similar comparisons between the odd animal weapons in games and in History? Let us know. You can contact the author @RedHeadPeak and find the whole blog on WordPress.